In honor of Tiramisu's visit, I wanted to take her somewhere fun, delicious, and reasonably priced! ^_^ Chat Sum Gol fits the profile. I love my Korean BBQ at a decent price and currently I like un-marinated meats more so this place is perfect for me. Everything is brought to your table and there's a bell on the side for you to press to call a server over. They actually do have servers who speak English and they will come around to change your grill, which is something I give them props for. Most places you have to ask for this service. Be sure to ask for the Sesame Oil with Salt & Pepper. It really brings out the flavor of the un-marinated meat. I barely managed a second round because I asked for a little more meat, but instead they brought out almost a full plate. Don't worry I was able to stuff it all down! ^_- They slightly changed the marinade for the pork belly. I don't recall it ever being spicy and thick. It wasn't really that spicy, but it tasted pretty good with the pork belly. All in all it was good food for a great place. How can you go wrong? The best part was spending time chatting with Tiramisu and it was great seeing her again! Can't wait to do it again! I will try my best to come up to LA sometime to hang out and you can meet Tofu! If I can drag him up before he leaves. Yes, Tofu is leaving California and moving back East because he is EVIL! 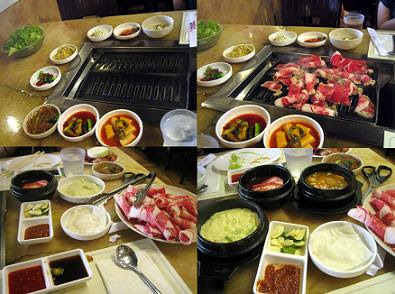 =P I hope Tiramisu had a wonderful time and I have turned her onto loving Korean BBQ! Daisuki! Aww I feel so speshul being in your post ^^. Yes I had a great time at Chat Sum Gol. The servers did speak English (and some were cute XD) and the service was decent. They were attentive and polite. It was a bit crowded, but the environment was lively. Word of the wise, if you plan on going somewhere nice after eating there, bring a change of clothes as it is smoky there with all the grilling. Added bonus is that they have free ice cream, which we didn't get as we went to Mochilato afterwards, but it's not like I had room after all the meat "Kat" piled on my plate! :P I'm still recovering from all that food on Saturday! Ha Ha! I only piled so LITTLE! We will have to build up your endurance for meat! ^_- Yes, I agree that you should bring a change of clothes or wear something crappy so that you don't mind that it smells. ^_^ It's worth the trouble! YUM YUM!